This is my inspiration kitchen, I love the I love the contemporary look of a white kitchen and the black stainless steel appliances. Is this your style? What would your remodeled kitchen look like? My kitchen is really showing it’s age. This summer, my daughter is getting married and we will be hosting a bridal shower and entertaining family and friends as we celebrate this blessed event. I’m looking at updating our kitchen and with all of our wedding expenses, I really need to stretch our dollars. 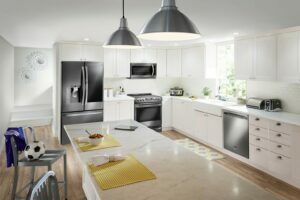 The Best Buy sales event featuring LG appliances is happening now. Read on to learn more about the special savings and the best deals of the season. This LG – InstaView™ Door-in-Door® refrigerator is 24 cu. ft. With the InstaView feature, you can see what is inside without opening the door and letting out the cold air out. Simply tap twice on the glass to illuminate the contents. Put your frequently used items inside the smaller door on the right side and just quickly grab what you need. Isn’t that a fantastic feature? 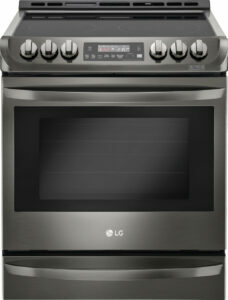 The LG Self-Cleaning Slide-In Electric Range looks so modern. It’s ENERGY STAR® compliant and features ProBake Technology. Head over to Best Buy to get all the details. 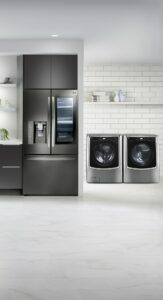 If you buy two eligible appliances totaling $1500, you’ll get a free gift card worth $100. This offer is valid through April 12. When you buy select Best Buy Kitchen Packages, you’ll receive up to $400 cash back by mail. This LG-specific offer is valid until May 3. Are you remodeling or updating your kitchen? Which appliances are you interested in? I love Best Buy for appliances. we plan on selling our home in 5 years and when we design our new kitchen this will be my go to place! I can’t wait until we own and I can redo my whole kitchen. i have a vision in my head and would love to accomplish that. I would be able to thanks to best buy! I can’t wait to remodel our kitchen! I’ll definitely be keeping Best Buy in mind for decor and appliances! I love your kitchen inspo. I love these new appliances! We have been shopping around and I keep coming back to these! We need a new fridge. That’s so cool that you can see what’s in it without opening it!